Kuumba (v., Swahili): to create. At the beginning of every Kuumba rehearsal, we begin with a moment of silence. In this moment, we leave behind the stresses of the outside world and step into the safety of home. We forget the traumas of our past and remember the beauty of our existence in spite of it all. We prepare ourselves to joy, sing, and dance our troubles over. Almost 50 years ago, Harvard did not have a space like this for black students. Racial tensions on campus and around the country were at an all time high. MLK had just been assassinated two years prior, and Black students were struggling to be heard, seen, and accepted on a campus that had not imagined their presence roughly four centuries prior. They saw the need to create a home where they could celebrate who they were and where they came from without fear or apology. So, they created Kuumba. Kuumba is a Swahili word that means to create and we take that to mean doing what we can with what we have to leave a space better than we found it. This mission permeates and motivates our performances, our community work, and our unabashed celebration of Black art. We firmly believe that Black art sustains and directs our culture; it reminds us of our past, makes us mindful of the present, and gives us hope and guidance for the future. And we are committed—now more than ever before—to celebrating and magnifying it wherever we go. Many have tried to define Kuumba in the past, tried to pin it down and make it fit into a comfortable box with a clear label. But to fully understand exactly what Kuumba is—and can be for you—you must experience it first-hand. As an organization, Kuumba is a choir, a community, a family, an experience, a school, a business, a home, a refuge, a struggle, a dream, a job, and a responsibility. In Kuumba, we begin our rehearsals with a moment of silent reflection, and we end them with a circle of support. In this circle, we extoll our blessings and name our sorrows. This circle of support not only closes out our rehearsals, it gives us newfound strength to shoulder any burdens we may have left at the door at the beginning of rehearsal. It exemplifies, in the best way possible, what Kuumba has been, is, and can be for so many: a bridge over troubled water. Whether you are a prospective member, an alumnus/ae, or an avid supporter, we invite you to come to any and all of the events we publicize on this website and our Facebook page, including our weekly rehearsals (Tuesdays & Thursdays in the Student Organization Center at Hilles) during the academic year. We truly hope that you will join us as we strive to leave spaces better than we found them, and honor our history through artistic expression, community involvement, and a continued commitment to fostering an atmosphere of creativity and social activism on Harvard’s campus and the Boston community. Want Kuumba to perform at your upcoming event? Fill out the request form, which will be sent to our business manager. Are you interested in being a part of our awesome community? It's really easy to join! We've got a lot of great events coming up this year. Be sure to check out our calendar for what's to come! 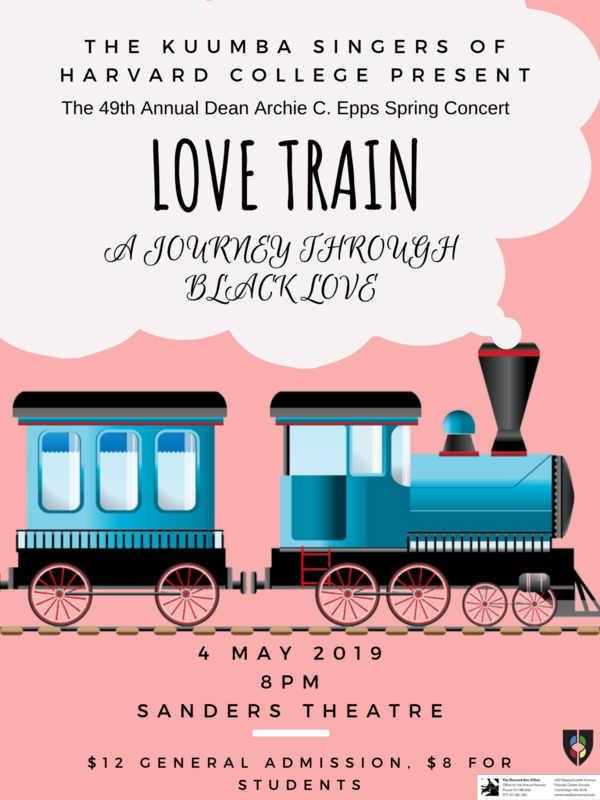 49th Annual Dean Archie C. Epps Spring Concert!